Burundi is among Africa’s most densely populated countries. 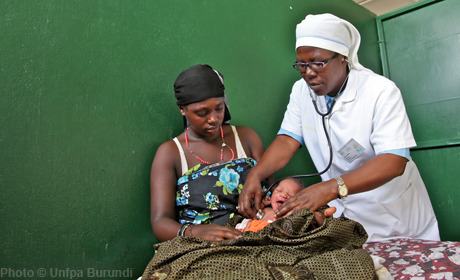 There has been progress in reducing maternal mortality, and the rates of skilled attendance at birth and modern contraception prevalence have significantly increased. Active in the country since 1975, UNFPA assists with continued efforts to make deliveries safe and provide family planning. It also facilitates young people’s access to essential reproductive and sexual health care services. UNFPA programmes further advocate for legislation to advance gender equality and assist in building the capacities of the national statistical system.